(Newser) – The move away from plastic bags became abusive and even violent in Australia over the past couple of weeks, Reuters reports. 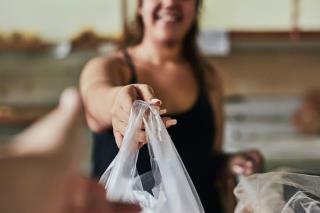 With retailers in most Australian states facing a fine for offering single-use plastic bags as of July 1, major supermarket chains like Woolworths and Coles began the transition early—and ran into a shocking dose of "bag rage." In one case, a male customer put his hands around a female worker's throat: "A male customer in the self-serve area swore loudly at a female worker," a union official tells the West Australian about a Woolworths incident. "She provided him with some complimentary bags and apologized. He made a mistake by scanning an item twice, the worker came to help him remove it and he walked up behind her and put his hands around her throat." Los Angeles County banned plastic in most stores....not all...but it's still better than having them flying around the streets... Give it a try...the reusable bags are cool.. When my wife and I moved to England (Dorset) in 1978, the first morning after our arrival we went to the local supermarket (tiny by comparison to our Canadian stores) to pick up some basic provisions. I can still recall the clerk ringing in everything manually (no scanners then). When she was finished and we paid, we all stood there looking at each other with the groceries arranged on the conveyor. We hadn't brought bags, and the store didn't provide them. Luckily, we managed to gather up some empty boxes to get everything home. So, for the balance of the year in England we adapted quite well, and taking our own bags (usually net-type bags) became second nature. And here we are, 40 years later, still bringing our own bags to Canadian shops. Getting with the program is easy, and feels good. Trees are a renewable resource, use paper bags!